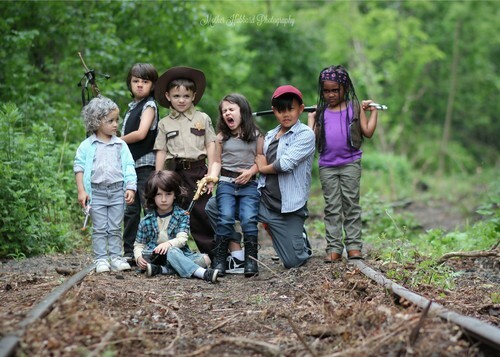 Baby Team Family. . HD Wallpaper and background images in the The Walking Dead club tagged: the walking dead mother hubbard photography babies 2016 kid cosplay carol peletier daryl dixon glenn rhee michonne rick grimes carl grimes maggie greene. This The Walking Dead photo contains matandazo, barrow, bustani ya gari, lawn gari, toroli, gari bustani, gari ya nyasi, wheelbarrow, and kabichi nyekundu.